Gold medallist two days earlier when partnering colleagues Jamila Laurenti and Evelyn Vivarelli to success in the Cadet Girls’ Team event; on the penultimate day of action, Thursday 6th April, at the 2017 Tunisia Junior and Cadet Open in Rades, Elisa Armanini was the player to stand out from the crowd. Competing on three fronts, the 15 year old Italian reached the quarter-final stage of the Junior Girls’ Singles and Cadet Girls’ Singles events, as well as the Junior Girls’ Doubles semi-final round. A last eight place in the Cadet Girls’ Singles event was to be anticipated; the no.4 seed, she accounted for the host nation’s Manel Baklouti, the no.5 seed (11-8, 12-10, 6-11, 11-6) to reserve her quarter-final berth. However, the same outcome in the counterpart Junior Girls’ Singles event was not to be anticipated; the no.10 seed, in the opening round she caused an upset of note by beating Algeria’s Hiba Feredj, the no.6 seed (5-11, 11-9, 11-4, 11-9, 11-5). A place in round two booked, a familiar face awaited in her quarter-final quest, colleague Evelyn Vivarelli was the adversary, a five games win was the verdict (11-7, 11-4, 11-7, 7-11, 11-6). Podium places a distinct possibility; in the Junior Girls’ Doubles event, for Elisa Armani a minimum bronze medal is guaranteed. Partnering colleague Jamila Laurenti, a semi-final place was reserved courtesy of success in opposition to Egypt’s Razan Fawzi and India’s Manushree Patil (11-6, 8-11, 11-13, 11-6, 11-4). The duo now meets the host nation’s Fadwa Garci and Abir Haj Salah; in the opposite half of the draw, Romania’s Adina Diaconu and Andreea Dragoman confront India’s Selena Selvakumar. Success in the Junior Girls’ Doubles event for the Romanians; it was the same in the Junior Girls’ Singles competition where semi-final places were claimed in style at Indian expense. Adina Diaconu, the top seed, beat Selena Selvakumar, the no.5 seed (11-7, 11-3, 11-7, 11-5); Andreea Dragoman, the no.2 seed, overcame Kushi Vishwanath (11-5, 11-2, 11-4, 11-2). At the semi-final stage Andreea Dragoman meets Elisa Armanini; Adina Diaconu opposes Lisa Lung, the no.3 seed, the 17 year old Belgian having accounted for Jamila Laurenti, the no.4 seed (11-4, 11-4, 11-4, 11-6) to keep her medal hopes alive. The reason for the earlier than predicted clash between the third and fourth seeds being the fact that in the group stage, Jamila Laurenti had finished in second place in her group behind Tunisia’s Manel Baklouti. Alas for Manel Baklouti, she was not able to maintain the form in the main draw; the no.11 seed, she was beaten by Evelyn Vivarelli (7-11, 14-12, 8-11, 11-8, 11-9, 11-4). 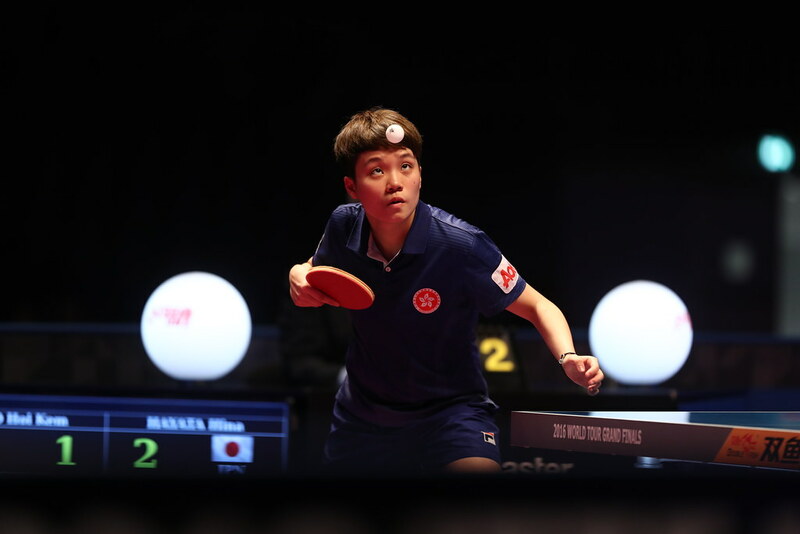 Success for the top three seeds in the Junior Girls’ Singles event; in the Cadet Girls’ Singles competition, the top four advanced the penultimate round. Additional to Elisa Armanini; at the quarter-final stage, Jamila Laurenti, the top seed, beat Tunisia’s Samar Hichi (11-5,11-6, 11-3); Egypt’s Farida Badawy, the no.3 seed, overcame Evelyn Vivarelli (9-11, 11-6, 11-9, 11-3). Meanwhile, in an all host nation affair, Fadwa Garci, the no.2 seed, ended the hopes of Islam Wenaiss, the no.6 seed (11-8, 11-6, 10-12, 8-11, 11-7). At the semi-final stage Jamila Laurenti meets Farida Badawy, Fadwa Garci opposes Elisa Armanini. Play concludes on Friday 7th April.